Exam period is right around the corner. By now, you need to be starting to think about your approach to exam preparation. Using library spaces and rooms might be part of your strategy – we think it’s a good one! 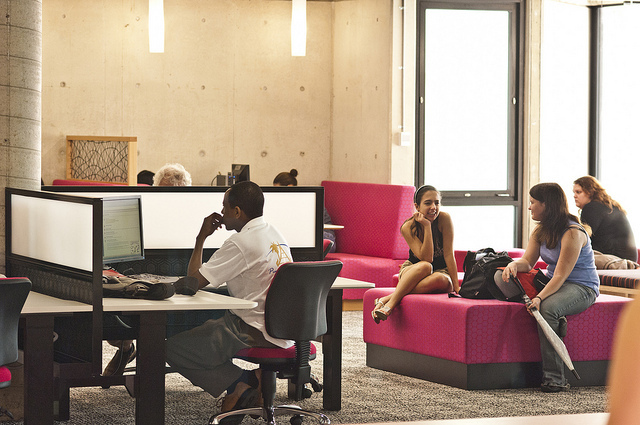 The library offers study spaces of different types – for study groups, for conversation and collaboration, for topping up your power supply or time to study on your own. Whatever your needs – on the floor, in a room, at a desk or on a couch, you’ll likely find your ideal study space. Rooms are available for bookings made in advance of your study sessions. Exam stress is real and you don’t need any extra when you’re trying to concentrate on exam revision. When using spaces in the library, particularly the collaborative zones, it’s a good idea to exercise a little consideration for your peers. Many of you will have exams and so many of you will be in the same boat – all in this together. Try not to listen to loud music. Instead, bring some earphones. You may like to bring a meal or snacks into the library. Totally fine with us! But maybe don’t be the student who brings the smelly or over-powering food. Don’t sit at a desk with a computer when you’re not using it. Another student might need it. Don’t put laptop cords across walkways. This causes a trip hazard. Not cool. Return library books on time. And this includes the course reserve items. Don’t be a scrooge! Planning when and where you’re going to study? Luckily, Gardens Point Library will again be extending opening hours during the study and exam period. From the 28th October until 10pm on 18th November the library will be open from 7am – 2am Monday to Friday and 9am – 2am on the weekends. There are ample study times for you to choose from, yay! For more top exam & study space tips, these other past blog posts have you covered. Now go ace that exam prep and those exams!